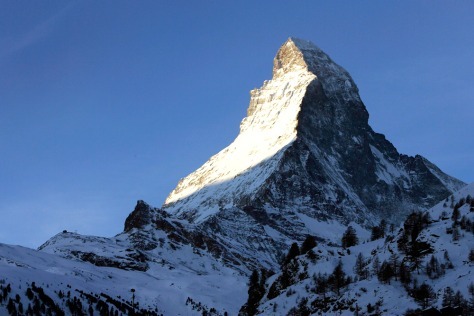 The rising sun illuminates the Matterhorn mountain, seen from Zermatt, Canton of Valais, South-Western Switzerland. At 14,690 feet (4,478 meters), the Matterhorn is not even the highest mountain in Switzerland - but it surely is the most photogenic. Walt Disney even borrowed its silhouette for Disneyland, debuting the Matterhorn Bobsleds ride in 1959.